From colonial to contemporary, we’ve rounded up the best things to do with kids visiting Boston. You’re wicked smaht for considering a trip to Boston with kiddos. Besides an early college tour (the area is home to almost 100 colleges and universities), Boston is harbor-deep in history as one of the oldest cities in the nation. From the Freedom Trail to Fenway Park, Boston is an energetic combo of colonial and contemporary. KidTripster Tip: Boston Duck Tours also depart from the Museum of Science and the New England Aquarium. Get up close and personal with the Charles River at the Museum of Science with floor-to-ceiling window views from the Yawkey Gallery. Journey through the exhibit halls to experience interactive demonstrations; my kids were partial to the hands-on pumping of a pig’s heart. Watch live animal presentations and see to a nearly complete Triceratops skeleton, named Cliff. The rotating exhibits are perfect for rainy day discovery along with the IMAX and 4-D films. Starbuck’s Coffee is available in the Riverview Café along with lots of lunch options. Cost: Youth (3-11) $20; Adult $23. KidTripster Tip: Explore the museum hands-free. Bring quarters and store your stuff in a locker near the entry. Learn about the lobster off your plate at the New England Aquarium. My kids were captivated by the cute penguins during a daily feeding, but their attention was diverted by an announcement about divers in a four-story ocean tank with sharks. Showing no fear, they got to touch one along with several rays in a hands-on exhibit nearby. When we go again, my nature lovers are already begging for a whale watch excursion (additional cost). Cost: Youth (3-11) $18.95; Adult $26.95. Little ones will love this place, but fair warning, you may lose them in the three-story climbing structure in the lobby. It’s pretty awesome. Also, get familiar with the characters from Arthur and Friends before you’re asked to step into the pretend sets from some of Marc Brown’s most beloved books. 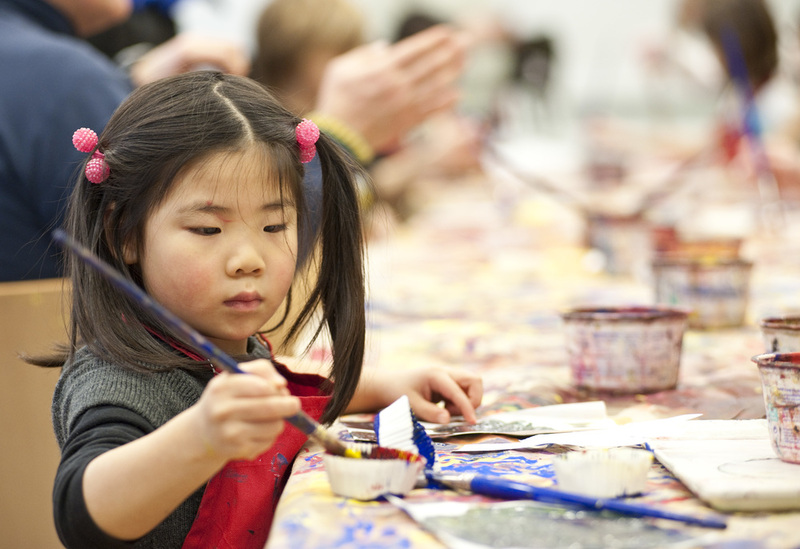 Plan for messy play at the Boston Children’s Museum with water, glue, bubbles, paint, and more. Cost: Youth (1-15) $16; Adult $16. 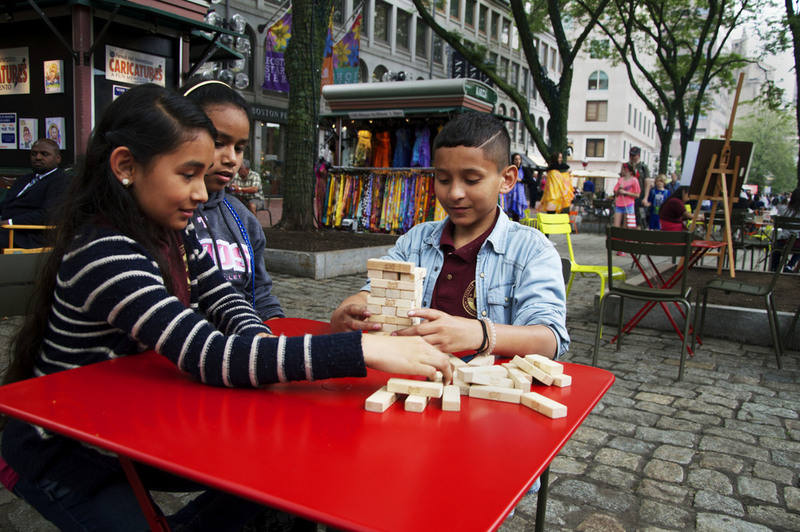 KidTripster Tip: Admission is only $1/person every Friday for Target Friday Nights from 5 to 9 p.m.
Street performers step it up at Faneuil Hall Marketplace, a former meeting house during the American Revolution, on any day of the week in downtown Boston. Follow an impromptu show with a quick snack at one of the food stalls in Quincy Market; I suggest chocolate chip cookies at the Chipyard. Then walk to Rose Fitzgerald Kennedy Greenway Conservancy for a spin on the carousel that features animal characters native to Massachusetts; the barn owl and sea turtle are our personal favorites. Carousel cost: $3/ride; $25/pack of 10. America’s oldest public park, Boston Common, is nestled downtown and boasts the starting point of the Freedom Trail, a 2-1/2- mile path throughout the city that leads to 16 historic places that played a part in the American Revolution. The Frog Pond can be found at the center of the Common and is the site of much splashing during the summer and ice skating during the winter. The carousel and playground nearby are highlights for kids of all ages, but the Swan Boats in the Public Garden make my girls swoon. Open in April thru September, the boats operate at a slower pace than almost anything else in the city. Costs: Youth (under 2) free; Youth (2-15) $2; Adult $3.50. KidTripster Tip: My girls love the hot dog stand between the Common and Garden on Charles Street. Cash only. Give your glutes a good stretch and then climb 294 steps (no elevator) to the top of the Bunker Hill Monument for a glimpse into history (or simply to wear out your kids). The Monument, standing 221-feet tall, commemorates the Battle of Bunker Hill in 1775, the first battle of the American Revolution. The Bunker Hill Museum across the street from the Monument features artifacts, murals, and more. This stop on the Freedom Trail is definitely one of our favorites. Cost: Free. Steer your family further along the Freedom Trail to the U.S.S. Constitution Museum (1 Constitution Rd., Charlestown) to learn what it took to sail on “Old Ironsides” during the War of 1812. The iconic ship will come to life for your sailors-in-training, who’ll want to try their hands at firing a cannon, scrubbing the deck, sleeping in hammocks, and unfurling a sail while balancing in mid-air. If you’re lucky, you may catch a live performance of sea chanteys by local singers that frequent the museum. Cost: Free with suggested donation of $20-$25/family. Need to lighten up after a tour of Harvard University in Cambridge? Catch the 4 p.m. family show (recommended for children ages 4-12) every Saturday at ImprovBoston. The shows are completely spontaneous and different each week thanks to audience participation. The combo of talented cast and coordinated music makes everyone giggle, even Grandma. Cost: Youth (12 & under) $8; Adult $14. KidTripster Tip: ImprovBoston has another family-friendly show, All Access Improv, on Saturdays at 6 p.m. geared toward teens. Find the Family Art Cart or stop by the Sharf Visitor Center to check out a Family Activity Tote, when you visit the Museum of Fine Arts. The interactive guides will engage everyone, and budding artists will have the tools to stop for a quick sketch after they see the vast array of American and contemporary art. The MFA hosts playdates for toddlers on the first and third Monday mornings of every month that include a story and craft. Cost: Youth (7-17) $10; Adult $25. Put a feather in your cap, and call yourself a "patriot." At the Boston Tea Party Ships & Museum, participation is key as live actors lead you through a restored ship from the Boston Tea Party and let you dump tea overboard. Huzzah! for Abigail’s Tea Room and Terrace at the end of the tour. Play colonial-inspired games, enjoy scrumptious scones and taste teas fit for a king. Cost: Youth $16; Adult $26. KidTripster Tip: Purchase tickets online for additional savings. Be prepared for your boys and girls to join Red Sox Nation after a trip to Fenway Park. Catch a game, if possible, and take a third-inning stretch to visit Wally’s Clubhouse for kid-friendly fun that includes an appearance from Wally, face painting, balloons, games, and a play area (open between the third and seventh innings only). If you aren’t visiting during baseball season, take a guided tour of the ballpark and stop at nearby Tasty Burger for baseball-style fare. Cost/Tour: Youth (3-12) $12, Adult $18. For Top 10 Stays in Boston, click here. For Top 10 Eats in Boston, click here. Carla Corban Kath lives in Boston with her husband and two daughters. She grew up fighting the humidity in Mississippi and has had flat hair ever since. The only thing that makes her hair stand up is spiders...and a day with no sugar.